Burning Man and Pyongyang are worlds apart, but both are equally hard to get into. Apparently getting tickets for Burning Man has become a real problem. A lottery system devised by the organizers has apparently backfired according to a report in the Times (“Burning Man Festival Regulars Lose Out on Tickets,” NYT, 2/13/12) “Festivalgoers from around the country are distressed about recent problems that left thousands of veteran Burners, as festival attendees are called, without tickets to the August event and might have landed tickets in the hands of scalpers,” the Times reported. If the festival were to become a totally commercial performance event like say The Book of Mormon, then a good part of its counter-cultural constituency would be lost, with only those willing to pay the higher prices winning out. Pyongyang has always been hard to get into for other obvious reasons and its constituency, one would suppose, has remained fairly consistent, with delegations from Mainland China filling up much of the available hotel space. 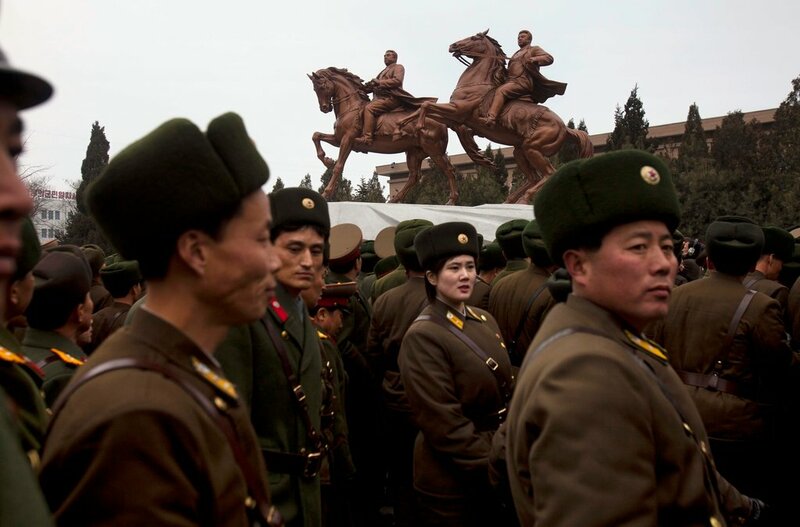 But there is an artistic community in Pyongyang and the “Pyongyang Festival of the Arts” is currently manifesting itself in the form of two equestrian statues of North Korea’s founder Kim Il-sung and his son Kim Jong-il. The photo by David Guttenfelder of the Associated Press which appeared in the Times is a happy reminder that totalitarian art is alive and kicking in North Korea’s capital. If you miss the old busts of Lenin installed when St Petersberg was still called Leningrad, then you should try to become a member of Yukiya Amano’s entourage. He succeeded Egypt’s Mohamed ElBaradei as the Director General of the International Atomic Energy Agency. Let's hope that under North Korea's new regime, this becomes a surefire way of getting into the country.